NADIA VAN DER MESCHT exudes a timeless grace and glamour but has her crafty hands firmly on the pulse of creative marketing and personal brand building. Many of you will be familiar with her blog Cupcake Couture which has undergone a lovely transformation, dusted with the same magic that Nadia applies to the web presence of her clients. NADIA's style journey is inspirational, from experiencing international luxe fashion, following her heart through to realising her personal design dream. A familiar face at the IHEART Market, Nadia has a wonderful eye for combining vintage found objects and trims to create objects of wearable beauty. Today's Giveaway is one of her splendid DIY GEOMETRIC BROOCH KITS, a fun and rewarding way to keep your fingers busy these holidays. I love these colours and how you can make something completely your own with just the right amount of direction! 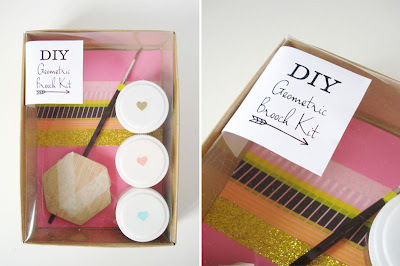 such wonderful style and love this diy brooch kit! Oh what fun! Love Nadia's goodies! She is far too talented. LOVE this! Such a cool idea! These are lovely. I saw them at I Heart Market. Looks amazing! I love making things but dont often get the chance too, I would love to spend the holidays making this beautiful brooch! Love the cute little hearts and the awesome colours! Co-Creating ensures no items will ever be the same. So unique. I've been following Nadia for a while now. This kit is a great idea. Such a talented lady and love her new look blog!!!! What a great gift idea for my craft night lady friends! I follow Nadyas blog, such lovely things come out of her creative mind. Missed being able to comment yesterday (hooray for public holidays, though!). I'm just getting back into making things, so would love to be able to play with one of these! Such a cool idea, something I'd love to get crafty with!! She's a very clever lady to come up with something that gets us involved in her creative process too! This brooch kit is such a cool idea. 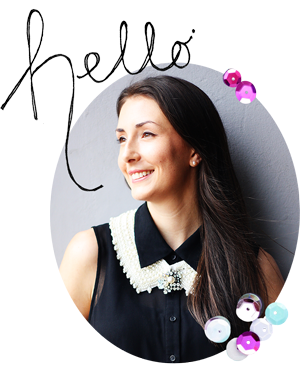 I love Nadia's style and her new blog is already on my list of favourites!